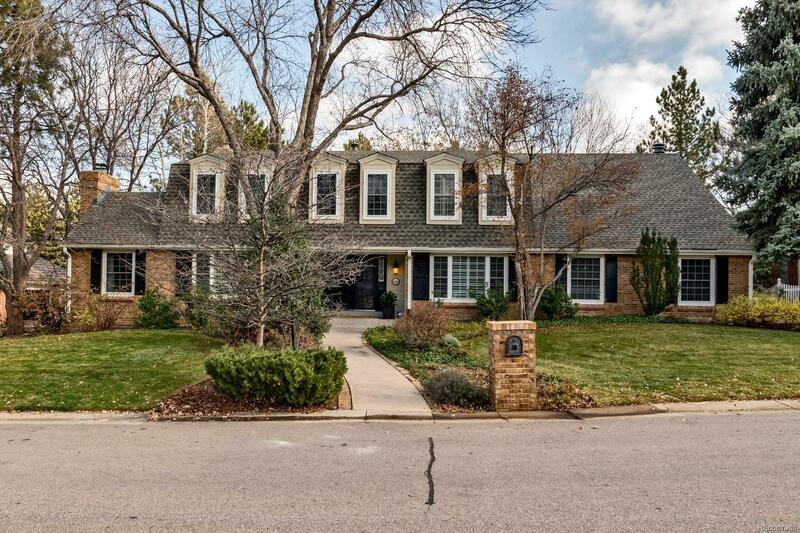 Immaculate, updated two story home in one of Greenwood Village's most sought after and exclusive neighborhoods, The Orchard at Cherry Creek. Located on a cul de sac with a large yard, 3 car side load garage and over 5200 square feet. This 5 bedroom, 4 bath home has a remodeled kitchen with slab granite, custom soft close cabinets with roll outs, under cabinet lighting, large island and beautiful butlers pantry. Custom upgrades including newer light fixtures, plantation shutters & wainscoat. Updated main floor powder bath. Just completed remodel of secondary bathroom - brand new vanity with quartz countertop, undermount double sinks, new tub, tile, faucets, and lighting. Main floor study and finished basement - great guest suite or nanny's quarters. Enjoy the lush, over 1/3 acre site with covered patio and hot tub. Cherry Creek Schools! Newer windows! 14 month silver plan Blue Ribbon Home Warranty provided.